The use of biomaterials has been a mainstay in oral and maxillofacial applications. In recent years, better understanding of biological and biomolecular responses to implant materials as well as advances in biomaterial engineering, have led to the development of novel biomaterials which incorporate various aspects of tissue engineering, regenerative medicine, nanotechnology, surface functionalization and composite systems. A key consideration in biomaterial engineering is biocompatibility, which is the ability for the implant biomaterial to illicit an appropriate host tissue response whilst avoiding and preventing undesirable effects. This consideration is highly specific to the intended function and site where the implant is being used. As such, keen appreciation of the physiology and anatomy of the implant site will be required during material selection and design. Amongst various metallic biomaterials, use of titanium and its alloys (Ti-6Al-4V) is one of the most widespread for oral and maxillofacial applications. Since its first use, titanium implants have the longest traceable record in clinical practice, receiving a success rate as high as 99 % for 15 years. Good biocompatibility, favorable tissue response, adequate strength and corrosion resistance are some of the key attributes which make it an excellent choice as a biomaterial worldwide. An important property to titanium’s good biocompatibility is its ability to form an oxide layer almost spontaneously when exposed to air, and it is this oxide layer which not only passivates the bulk metal, but more importantly induces apatite formation (the main inorganic component of natural bone) when implanted. However, the use of titanium implants is not without certain issues. Incomplete osteointegration can still occur where there is insufficient contact between the metal and host bone. Methods to address these issues include surface modifications (sand blasting, acid etching, plasma coating to name a few) to increase surface roughness, oxide layer and bioactivity. Ceramics have been used as biomaterials for oral and maxillofacial applications due to their properties of good bioactivity, high hardness and wear resistance. Bioceramics can be categorized based on the biological response when they are implanted: bioinert or bioactive. Bioinert medical materials generally do not result in any host tissue response, and remain in the implant site without osteointegration. Bioactive medical materials provide a conducive environment which interacts and changes with its implanted environment. With bioceramics, bioactivity is commonly associated with osteoconductivity, whereby the biomaterial functions to guide and facilitate bone attachment and in-growth. However, bioceramics are typically brittle in nature, and cannot be used alone in high load-bearing applications. Some of the common bioceramics are apatites, calcium phosphates and bioglass. Nanotechnology refers to the manipulation, synthesis and fabrication of materials at the nanometer-scale. It has been widely regarded as a tool which will enable the engineering of next generation biomaterials. Applications of nanomaterials in oral and maxillofacial health is becoming increasingly common due to numerous advantages, which can be realized through engineering at the nanometer-scale. Nanostructured materials display physical properties which are distinctly different from the same material at the micrometer-scale. At the cellular level, nanoengineered features have been shown to elicit specific biological responses. Even recent efforts at elucidating of cell-cell, cell-matrix interactions have been focused on nanometer-scale material manipulation, targeting specific up-regulation and signaling pathways. Indeed, nanostructured titanium implants have shown to promote osteoblast adhesion, spreading and proliferation. Ligand specific signaling through nanoscale Arg-Gly-Asp (RGD) functionalization on titanium surfaces have also shown to improve osteointegration. Nanosized calcium phosphate coatings on implant surfaces through sol-gel transformation have also reported to improve implant mineralization. Thus, materials previously regarded as inadequate for osteointegration may be considered once more due to nanosurface functionalization. Nanomaterials offer the advantage of very high surface to volume ratio, and are relevant as carriers for targeted and controlled delivery of growth factors, drugs and other therapeutic substances. They can enable the realization of tissue regeneration, where diseases can be treated by injecting these nanomaterials to deliver the therapy in a spatially and temporally controlled manner. A large portion of failures in oral and maxillofacial treatment and complications is due to recurrent microbial infection, leading to implant failure. Incorporation of silver nanoparticles has been shown to improve the antimicrobial properties, significantly. Furthermore, smaller-sized silver nanoparticles have been associated with greater efficacy, owing to their increased surface to volume ratio and ability to disrupt bacteria membrane, effectively. In conclusion, biomaterials play a pervasive and integral role in oral and maxillofacial applications. Through greater understanding of physiology and biomolecular processes, better considerations can be made to the selection, design and development of biomaterials. Owing to the diverse function that each tissue plays, various metals and ceramics have been used for specific oral and maxillofacial applications. These materials can also be incorporated as composites to overcome shortcomings of an individual material. Advances in engineering techniques, in particularly nanotechnology, have opened up a myriad of possibilities which promise to revolutionize the way biomaterials are made and improve biomedical outcomes significantly. Future research endeavors should continue elucidating the mechanism of osteointegration, uncover specific implant-tissue responses and their associated internal mechanism, thereby improving on our model of biomaterial engineering. This book is divided into four major sections. The first section provides basic insights into human anatomy including the structure of bone and the functional anatomy of the skull. The next two sections focus on the applications of mathematical and computerized modeling methodology in dentistry as well as in oral and maxillofacial surgery, not only at a research level but also at a clinical level. Mathematical models and experimental studies are two distinct approaches that can be used to further our understanding of the stress and strain environment in mammalian jaw. Despite the fact that accuracy as well as the possibility (to a certain extent) of characterizing the biomechanical behavior of the mandible are offered by experimental studies, mathematical approaches provide unparalleled precision in the representations of magnitudes, gradients, and directions of stresses and strains throughout the entire mandible. The detailed biomechanical events associated with the functional loading of the human mandible are not yet fully fathomed. In general, the methodologies used to record them are extremely invasive. In this regard, computational modeling and simulation offer a promising and alternative approach with the additional capability to predict regional stresses and strains in inaccessible locations. The ability to extract data from computed tomography (CT) or any other appropriate imaging technology to generate the patient’s own model is already a common practice. For example, by integrating computerized modeling with medical imaging, it would be possible to determine the correct location, configuration, size and number of implants needed to address the patient’s functional and restorative needs. Furthermore, this approach can be used to define the form and mechanical requirements of implants and prostheses employed in the treatment of mandibular and maxillary fractures with fixation and reduction of the fracture obtained with minimal osteosynthesis plate bulk, number and size. This integrated system can be coupled with modern rapid prototyping such as 3D printing and laser sintering to produce superstructures and patient matched dental devices and guides. In the last section, this book will cover the types of bioceramics and surface modifications currently used in dentistry and oral and maxillofacial surgery as well as their production methods and properties. Bioceramics performed singular and biologically inert roles when utilized as implants prior to the 1970s. The limitations with these synthetic materials as tissue substitutes were highlighted with the growing realization that tissues and cells within the human body performed numerous different vital regulatory and metabolic roles. The demands of bioceramics have changed since then, from maintaining an essentially physical function without eliciting a host response to providing a more positive interaction with the host. This has been accompanied by increasing demands on medical devices that they not only improve the quality of life but also extend its duration. Of even greater importance are the exciting and potential opportunities associated with the use of nanobioceramics as body interactive materials in, helping the body to heal, or promoting the regeneration of tissues, thus restoring physiological functions. The relationship between biological responses and surface properties of materials is one of the main issues in biomedical materials research. Currently, one of the key drawbacks of synthetic implants is their failure to adapt to the local tissue environment. Improvements in reliability and biocompatibility of implants and prostheses can be achieved through surface modifications. Surface modification of metallic materials using biomaterial thin films and nanocoatings is intended to stimulate bioactivity, biocompatibility and reliability, while at the same time reducing or eliminating corrosion and metal ion release. Important factors in determining the capability and performance of coated implants under physiological environments are their mechanical and adhesion properties. More importantly, computational modeling approaches are vital in the progress of understanding the interfacial behavior between a coating (or thin film) and the substrate material used. The knowledge gained will result in better design and selection of coating and substrate materials. We would like to acknowledge the hard work and efforts of the editorial team at Bentham Science Publishers and in particular Ms. Hira Aftab. The authors declared no conflict of interest regarding the contents of each of the chapters of this book. 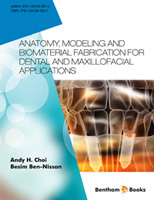 “This book will be a significant addition to the current literature on this important topic of Maxillofacial Biomaterials.” – Dr. Ma Qian, Professor of Advanced Manufacturing and Materials, RMIT University, Australia.